Home Secretary Amber Rudd has insisted the UK wants to maintain a "deep and special partnership" with the EU after Brexit. German Chancellor Angela Merkel said on Saturday that Europe now had to "fight for its own destiny". She said the EU could no longer "completely depend" on the US and UK following the election of President Trump and Brexit. But Ms Rudd said the UK wanted to continue to work closely with the EU. Speaking on BBC Radio 4's Today programme, she said: "As we begin the negotiations about leaving the EU, we will be able to reassure Germany and other European countries that we are going to be a strong partner to them in defence and security, and, we hope, in trade. "This is going to be the most important negotiation that this country has embarked on for many decades. Making sure that we get this right is going to be absolutely critical, and we don't underestimate the difficulty. "We can reassure Mrs Merkel that we want to have a deep and special partnership so that we can continue to maintain European-wide security to keep us all safe from the terrorists abroad and those that are trying to be nurtured in our country." Prime Minister Theresa May restated her desire to work closely with the EU countries during a campaign event in Twickenham, south west London, on Monday afternoon. She said: "We are not leaving Europe. We are leaving the European Union. But it is right that the European Union themselves will have some decisions to take about the nature of that organisation and institution going forward." Also speaking on Monday, Germany's interior minister Thomas de Maiziere predicted that Brexit should not have a significant negative impact on security. He said: "I am confident that the issue of security cooperation will not be among the most difficult issues in the Brexit negotiations. A lot unites us here." Mrs Merkel's comments - which she reiterated at a press conference on Monday - came after Mr Trump refused to re-commit to the 2015 Paris climate deal at the G7 summit. Mrs Merkel is on the campaign trail ahead of elections in September. "The times in which we could completely depend on others are on the way out. I've experienced that in the last few days," Mrs Merkel told a crowd at an election rally in Munich, southern Germany. The relationship between Berlin and new French President Emmanuel Macron had to be a priority, Mrs Merkel said, adding: "We Europeans have to take our destiny into our own hands." On Saturday, the German leader had described climate change talks at the G7 group of rich nations as "very unsatisfactory". Leaders from the UK, Canada, France, Germany, Italy and Japan had re-affirmed their support for the Paris accord - but Mr Trump said he would make a decision in the coming week. Mr Trump has previously pledged to abandon the Paris deal, and expressed doubts about man-made climate change. Speaking in Brussels last week, Mr Trump also told Nato members to spend more money on defence and did not re-state his administration's commitment to Nato's mutual security guarantees. Mrs Merkel's latest comments are partly a move to appeal to German voters first and foremost, the BBC's Europe editor Katya Adler says. 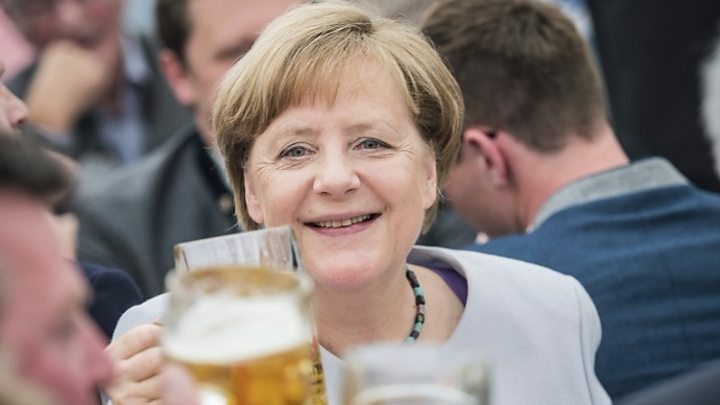 Polls suggest Mrs Merkel is on course to be re-elected for a fourth term as German chancellor at elections in September. Nato and Trump: What future for the Atlantic alliance?